[tie_index]Introduction[/tie_index]Travel agent is a person who has a full knowledge about tourists product – destinations, modes of travel, climate, accommodation and other areas of the service sector. He acts on the behalf of product providers/principles and in return get a commission. Technically, a travel agent is an owner or manager of an agency, but other employees are responsible for advising tourists and selling packages tours/individual components of travel products. A travel agent may be an individual /firm or corporation which is commonly known as a travel agency. An agency means the office of travel agent or organization where all travel goods and services are assembled and coordinated for the smooth conduct of travel agency business. Travel agency is one of the most important organization in the tourism private sector which plays a significant and crucial role in the entire process of developing and promoting tourism in the country or at a destination. It is a travel agency which packages and processes all the attractions, accesses, amenities and ancillary services of a country and present them to tourists. That’s why travel agency is known as ‘image builder‘ of a country. A prospective travel agency is one which makes arrangements of travel tickets (air, rail, road, and sea); travel documents (passports, visa and other documents required to travel); accommodation, entertainment, and other travel-related services from principle suppliers. It may also secure travel insurance, foreign currency for traveling people. The first Travel Agency of the world was established by Thomas Cook in 1845 in England. The use of the term travel trade dates back from the early years of the 19th century, but this should not obscure the fact that what we today describe as travel trade (travel agency and tour operation business) was taking place much earlier in history. Throughout the history, there was travel middleman who helped the merchants traveling for trade and other who traveled for religious purposes. In 1841 a fortunate day comes in the history of travel trade when Thomas Cook, as secretary of South Midland Temperance Association, organized a trip by a train for 570 members for his association to the distance of 22 miles. He bought railway tickets in bulk to sell them to people. The experiment was successful and everybody was exultant. Mr. Cook had done his job on a no profit basis. But, incidentally, It gave him a new idea and turned it into a tour business. Four years later in 1845, he set up a ‘World’s First Travel Agency‘ to organize excursions. 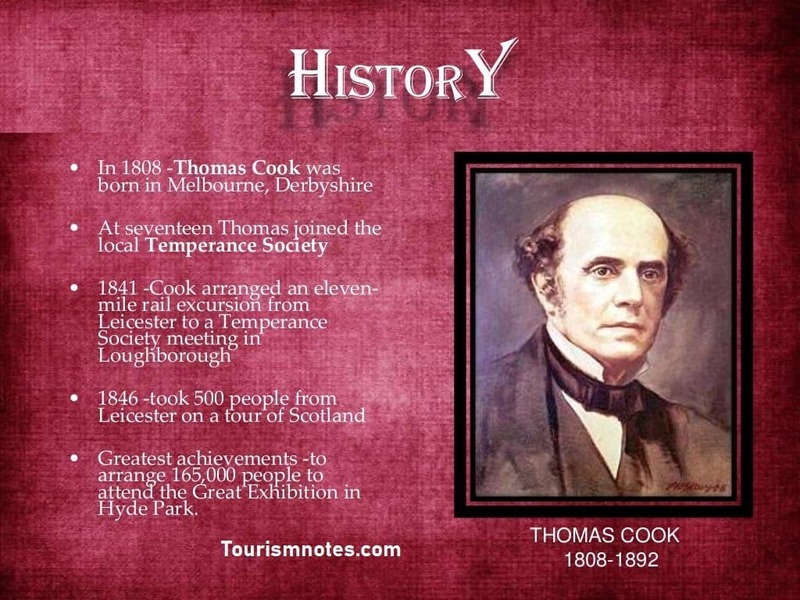 Due to this innovative approach, Mr. Thomas Cook is known as the Father of Travel Agency Business. He co-ordinated railway and steamship excursions throughout England, Scotland and Europe. However, the railways only gave him 5% commission which was not enough to meet his overheads, so he decided to diversify this business into tour operation. In 1855 Mr. Cook started operating package tours. He conducted the world’s first international tour from England to the Paris. 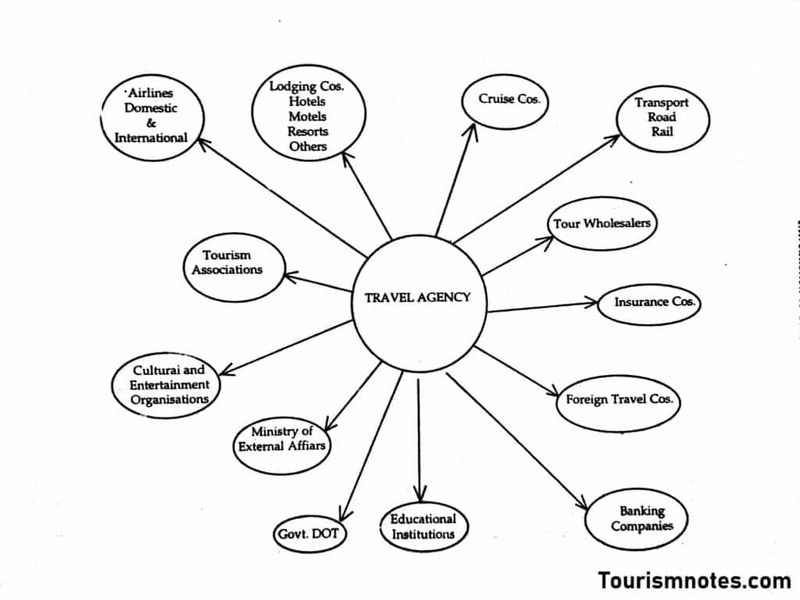 Travel agencies are basically categories in two types-: Retail Travel Agency and Wholesale Travel Agency. A retail travel agency sells tourists products directly to the public on the behalf of the products suppliers and in return get commissions. Some package tour is sold in two ways i.e., on a commission basis and mark up the price. When a travel agency sells a tour on the marked-up price it means that first, it markup the cost of the tour and then sell it at a higher rate. The markup price is the difference between retail price and wholesale cost. The main source of the revenue for the travel agency is the commission received from the vendors. However, the rate of the commission differs from organization to organization an travel component to the travel component. A travel agency receives appx. 95% of their revenue from the commission, and the remaining 5% from consultancy services and others. These agencies are specialized in organizing package tours, which are marketed to the customers/tourists through the network of a retail travel agency or directly to the prospective clients ( if wholesale travel agency has a retail division). A wholesale travel agency purchases tourists product components in the bulk and designs tour package. Sometimes, a wholesale travel agency buys travel components from the vendor in bulk and resell them to another travel business originations. Wholesale travel agencies assemble package holidays and sell them to the clients through retail travel agencies. A typical package tour includes – air tickets, accommodation, and something other services may also be included in it such as entertainment, sightseeing, and sports activities etc. These packages are referred to as ‘package tours’ most of these tours include the services of escorts but a few are sold to people who wish to travel independently. Now a question arises – How a wholesale travel agency generates profits? Generally, a wholesaler receives volume discounts from the principal suppliers because a wholesaler might agree to purchase a large number of seats from a particular airline or reserve a large number of room at a particular hotel or resorts. Practically, a wholesaler who sells package vacations/tours is called a Tour Operator. However, technically there is a difference between a wholesaler and a tour operator. A wholesaler who sells tourists product individually without assembling them into a package tour is called as a Consolidator. Mostly, these are specialized in particular product components such as air tickets, accommodation, and conference, and conventions etc. Wholesale travel agency does not sell directly to the public, while tour operators do sell directly to clients. Wholesale travel agencies are less inclined than tour operators to perform ground services i.e. handling agency or ground operators. A wholesale travel agency may deal with one component of travel product while a tour operator offers a variety of tour programmes. The size of the business is large in the case of tour operators in comparison to a wholesale travel agency. An important link between the clients and principal suppliers. Provider of an authentic and reliable travel information. A social a continuous process. Establishes a good relationship with clients and vendors. These are the most important features of the Travel Agency Business. Further, more than 60% of all travel agency revenues are derived from business travel. Most travel agencies sell both commercial and leisure travel but there are many travel agencies which only specialized in one sector or the other. Whatever the size of a travel agency, it has to provide necessary travel information to tourists. A travel agency must give up-to-date, accurate and timely information regarding destinations mode of travel, accommodation, sight-seeing, shopping, immigration, passport, visa, customs clearance and procedure, health and security rules and about various permits required to travel in particular areas etc. The term tourists itinerary is used to identify the origin, destination and all the stopping points in a traveler’s tours. It is a composition of various elements and designed after a detailed study of the market. Travel agencies prepare an itinerary for tour packages. A travel agency sells a variety of tourism products. Airline ticketing and reservation is still a major source of revenue. Travel agencies perform a function of airline ticketing and reservation on the behalf of various airlines. Travel agencies prepare tour package and sell them to tourists. The coasting and pricing of tour packages depend to a large extent on the ability of travel agent as to how effectively he is able to negotiate with the principal suppliers. It is a very important function of all types of travel agencies. A travel agency consistently makes linkage with the accommodation sector, transport sector and other entertainment organizations to reserve rooms, and seats in the cultural programmes and transportation. Some large-scale travel agencies perform additional functions to serve its clients. Travel insurance protects the travelers against the personal as well as baggage losses resulting from a wide range of travel related happenings and problems. Approved travel agency authorized by Govt. body provides currency exchanges services to tourist. Large-scale travel agencies offer a complete convention/conference package which includes registration of the participants at the venue to be picked up for dropped to the airport/hotel, overhead projectors, slide projectors, TV, VCR, information counter, sightseen etc. Basically, a travel agency serves two type of clients: business travelers and leisure travelers. Incidentally, the requirements of these tourists are different and an agency has to assemble or purchase related components from the principal suppliers to cater to their needs. Essentially, travel agencies maintain close ties with Airlines, hotels, car rentals, banks, insurance companies, railways, government, trade associations, foreign tour operators and travel agents, ground operators, cruise companies and tourism educational institutes.